In 4 1/2- to 5-quart Dutch oven, heat oil over medium-high heat. Add onions and garlic; cook 4 to 5 minutes, stirring frequently, until onions are softened. Stir in remaining ingredients. Heat to boiling. Reduce heat to medium-low. Cover; cook 15 to 20 minutes, stirring occasionally, until chili is hot and vegetables are crisp-tender. Keep a variety of canned beans on your kitchen shelf and a mix of frozen vegetables in the freezer. Then when the question, "What's for dinner?" is asked, this hearty chili is the less-than-an-hour answer. For a chill-chasing meal, serve this zesty chili with cornbread and a crisp green salad. 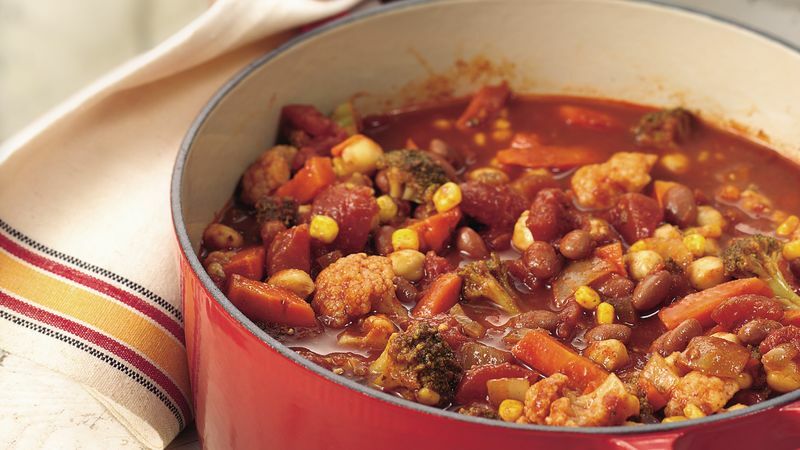 Any combination of your favorite vegetables or canned beans will work well in this recipe. Try canned black beans, black-eyed peas or butter beans.